WHILE conversations about blockchain in recent years have revolved around cryptocurrency speculation, major hacks and initial coin offerings (ICOs) — the controversial fundraising exercise — there has been a clear shift in opinion as more corporations are looking to integrate the technology into their operations. According to EY Global blockchain innovation leader Paul Brody, the level of education on and awareness of blockchain technology is rising. “Two years ago, nobody knew what blockchain was and it was closely associated with bitcoin, which made it very hard to get the conversation going whenever we talked about blockchain,” he tells The Edge. In Malaysia, several listed companies have announced blockchain-related pursuits with some even partnering the more established players in the field. For example, CIMB Group Holdings Bhd has announced a strategic collaboration with Ripple to enable instant cross-border payments across its various markets. Another example is e-government service provider MyEG Services Bhd, which has unveiled blockchain-based payroll management software, PayMe, which will be undergoing pilot trials at selected sites. The group said it was focused on leveraging the benefits of blockchain and was working with Universiti Malaya to promote the development of blockchain technology. Other companies are more interested in the cryptocurrency side of the coin. They include Cuscapi Bhd, which is planning to set up a cryptocurrency exchange in the Philippines, and Country Heights Holdings Bhd, which is looking to issue its own digital token, Horse Currency, to raise funds. Some companies in the public sector have also become proponents of blockchain technology, such as Shah Alam MP Khalid Samad, who has been endorsing Harapan Coin, touted as the world’s first political ICO. The regulators are also stepping up their game — the Securities Commission Malaysia will be introducing a framework in the first quarter of 2019 to regulate digital asset exchanges and ICOs. EY has added blockchain to its suite of solutions for clients, says Brody, adding that more companies have approached the consultancy enquiring about blockchain and whether they could leverage the technology to improve their operations. “In fact, clients come up to us and tend to want to use blockchain as their preferred solution because they had heard so much about it. But we flip the conversation around and ask the client about the issues they are looking to solve and see whether blockchain is the right solution. “Most of the time, blockchain is not a standalone solution. It has to be combined with the right processes, governance and perhaps other technologies as well. It’s not the answer to everything, like how the hype makes it out to be,” he explains. By using blockchain, companies can streamline and accelerate business processes by reducing the need for intermediaries, which would translate into lower costs. Proponents of blockchain touted the technology as the solution to most of the world’s problems, especially during the ICO boom last year. This is quite far from the truth. Every piece of new technology goes through the hype phase, says Brody. It starts with an innovation reaching a peak, when proponents call it the answer to every problem, followed by a trough, when the hype dies down, giving rise to more sceptics and critics. Brody cites previous innovations such as biometric identification, location-based services and mobile banking as examples. These were all over-hyped when they emerged in the market about 15 years ago. “Many of the things that people then said was hype or would not work are being used by the masses multiple times every day. We use our fingerprints to unlock our phones a hundred times a day. 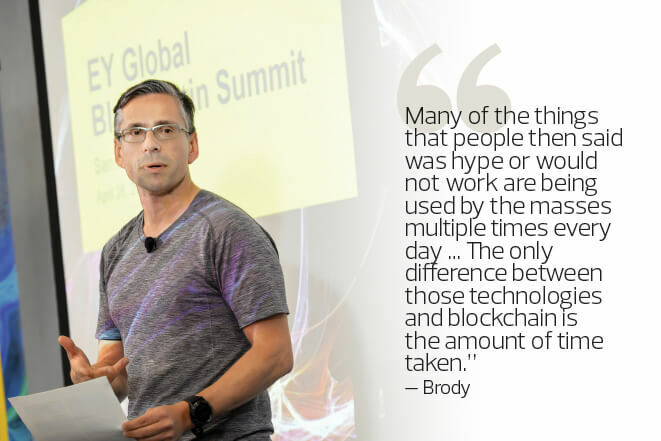 The only difference between those technologies and blockchain is the amount of time taken,” Brody explains. He believes blockchain is past the hype stage and is currently in what observers dub “the trough of despair”. Similar to the dotcom bust in the late 1990s to early 2000s, a lot of the projects that have done ICOs and launched blockchain services will crash, separating those that were in it for the hype from those that actually have useful solutions. When the dotcom bubble burst, many internet companies, such as online pet supply store Pets.com, online groceries retailer Webvan.com and online toy retailer eToys.com, became insolvent. But the era also gave rise to giants like Amazon and eBay. “Over the next couple of years, many of the companies that did ICOs will go broke, simply because they were not very good at what they were doing or they did not find a way to address the problems they faced. “There will be fewer blockchain software companies two years from now but the ones that survive will be doing real work for industries and companies,” says Brody. Many startups have come up with their proofs of concept and prototypes, which he says is the easy part as there is not much to lose. The work that comes after that is much more challenging, with the industrialisation and scaling up of the projects so that they can be implemented and used by companies in their operations. This requires huge investment, adds Brody, which forces the adopters to take a serious look at the net benefits that they can gain from using blockchain. “We are currently doing a very large project for one of our clients. The prototype took only six weeks but the industrialisation will take over a year from start to finish. The reason is that the company will need to integrate the new system with the legacy systems that are already in place and connect it with their clients’ systems. However, this will not deter the adoption of blockchain, stresses Brody. Despite the critics and naysayers, any new technology needs a roughly 10-year cycle before it becomes mainstream. He points to the adoption of cloud, the rise of the personal computer and the emergence of smartphones, saying all these revolutionary shifts began and ended in 10 years. “A good example is the public cloud. Back in 2006, Amazon launched the public cloud with AWS and if you asked any chief investment officer out there whether they would put their company’s business on the public cloud, the response would have been ‘over my dead body’.